Planescape: Torment seemingly has a cliche start to one of the greatest RPG stories ever told. You wake up with no knowledge of who you are. You have to go on a journey to find out why your memory is gone, and how you ended up in this state. If you're an RPG veteran, then you've seen this plot hundreds of times. It's an easy way to start a game, because amnesia puts you and the character on the same foot. An amnesiac character means dialog can be given over to world-building; after all, it's hard to feel like your character has lived in a world if they're asking basic questions of its structure or having everything explained to them. It's the unique twists that matter though,and that's where Planescape: Torment lives. 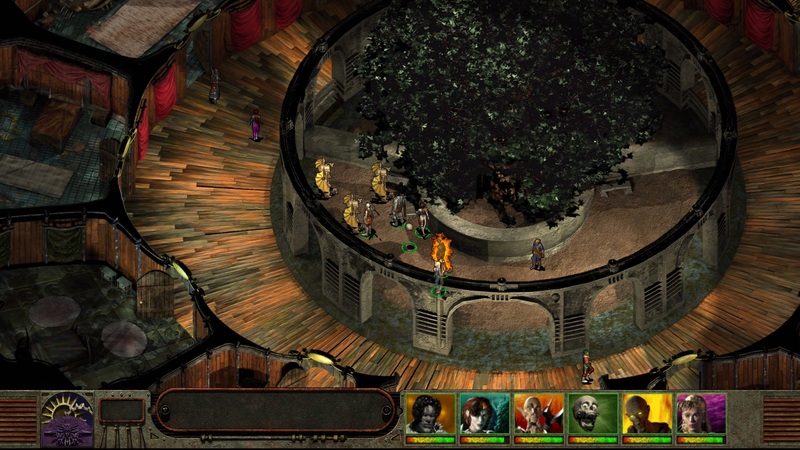 Planescape: Torment was built on the Infinity Engine, the BioWare-developed engine that formed the core of Baldur's Gate. It came out a year after that title had established itself as the premier Dungeons & Dragons experience on PC. If Baldur's Gate was the parent, then Planescape: Torment was the teenager rebelling against everything their parent represented. You wake up in the Mortuary, a vast storeroom of corpses. You're supposed to be one of these corpses, but after a series of cryptic dreams, your caveman-looking self rises and steps off the slab. You're immediately joined by Morte, a friendly floating skull who acts as your early guide. Right from the beginning, the dialogue jumps out at you: Morte asks who your are, but since you don't know, you can argue back and forth with him. 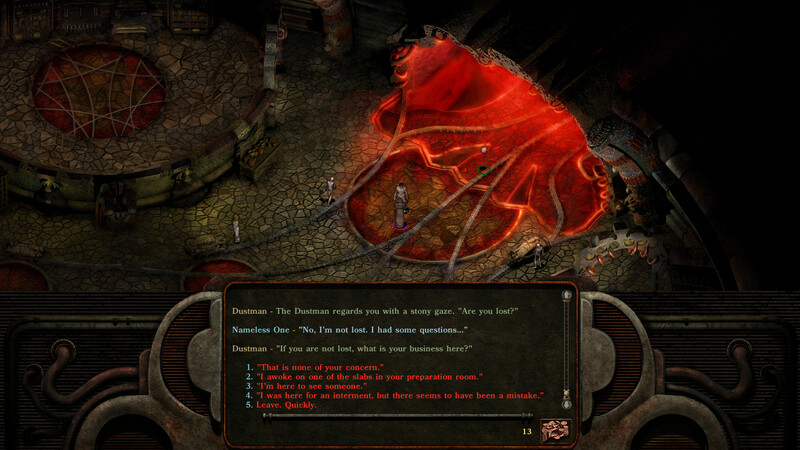 While Baldur's Gate was more traditional fantasy, Planescape: Torment is more irreverent in its delivery: the language is looser, and you can tell the writers are having some fun with it. Morte feels like a sidekick in a movie like Indiana Jones. Once you exit the Mortuary, it's clear that you're not in the normal fantasy setting established by the works of J.R.R. Tolkien and Dungeons & Dragons' core modules. Even in the Mortuary itself, you're walking across rooms of weird, warped architecture and sigils, having conversations with the Dustmen, a faction that seeks the "True Death". Most of Planescape: Torment takes place in the city of Sigil, a place of monoliths, sweeping curves, and arcane magic. But what you won't see are elves, orc, and dragons. You won't fight kobolds or giant rats. You won't enter a tavern and sit with a mug of grog while a bard shares the exploits of local adventurers. Planescape: Torment skips all that with a campaign that tried to bring together all of the various Dungeons & Dragons locations. Sigil is the city at the center of multiverse, with doors to several Planes of existence, andat the heart of the city are various faction vying for control. Anything could end up in Sigil, giving dungeon masters and Black Isle Studios the freedom to expand wherever they wanted. When Black Isle Studios pitched the game to publisher Interplay Entertainment, the main focus was not do what had been done before. "The premise behind Torment came solely from a desire to do something different," Planescape: torment lead designer Chris Avellone told IGN Vault back in 1998. "We had the whole Planescape multiverse to work with, and the last thing we wanted to do was create the standard role-playing game experience. We wanted to turn the RPG experience on its head and hit the player with a horde of new ideas about what an RPG could be about. So, we decided to have the game begin where most RPGs end: on the death screen. In other RPGs, you die, you see the death screen, you reload. In Torment, every death screen is an opportunity to advance the story." Even beyond the setting itself, Planescape: Torment plays around with the idea of an RPG party. At this point in time, most of the characters that would join a player's party in other RPGs would simply follow in lockstep. Regardless of how each character would feel about your actions, they'd still follow you into hell. You could kill their parents and they'd either say nothing, or offer some token anger, before slotting right back into your army. Baldur's Gate started to play with this idea, and Planescape: Torment took it further. Ultimately, this is why Planescape is remembered so fondly along with Baldur's Gate and Fallout-your choices all matter. And further, there's a wide variety of choices to make. Your character build, your stats, your classes, your dialog choices, and even your companions all combine to determine how you progress through Planescape: Torment's main story. It's a game that challenges you to find your own way forward. Yes, there are limitations in what the developers can let you do, but Torment doesn't feel like the limitations are there. The illusion of a wide open field of options is what a great RPG is about, and Planescape: Torment pulls it off beautifully. Tagged with Beamdog,	Black Isle Studios,	Interplay Entertainment,	Opinions,	PC,	Role Playing Games,	Top 25 RPGs.